Crystallorum Legendarium is a high fantasy setting created by S.A. Hannon that draws its inspiration largely from JRPGs. It details a sprawling cosmology of worlds in the interplanar soul-mists called the Twilight, their surrounding crystal spheres echoing the world-crystals at the heart of their plane. The webcomic The Genesis Sword is in the Legendarium setting, and d20 campaign setting books are planned for the future. 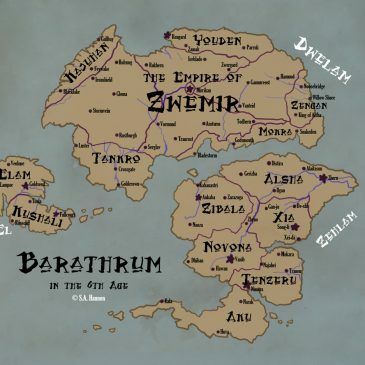 A map of the three continents of the world of Barathrum; during the Seal of the King, year 1728, Sixth Age. Art and worldbuilding by S.A. Hannon.